Everest Base Camp Trek in May Doable? Home / 10 Best Treks in Nepal – The Ultimate Guide for Trekking in Nepal / Everest Base Camp Trek in 2018: The Ultimate Guide / Everest Base Camp Trek in May Doable? Everest Base Camp Trek in May!! Too much cold means nights can be freezing cold. Too hot a weather while trekking and you might sweat. Too much rain and it becomes difficult to view the mountains as clouds block the view. The month of May doesn’t have any of these problems. Spring delights everyone. And especially if you are a trekker to Nepal, the mountains come to life, the vegetation blossoms, the rhododendrons bloom and all the animals come out of their hiding in spring. 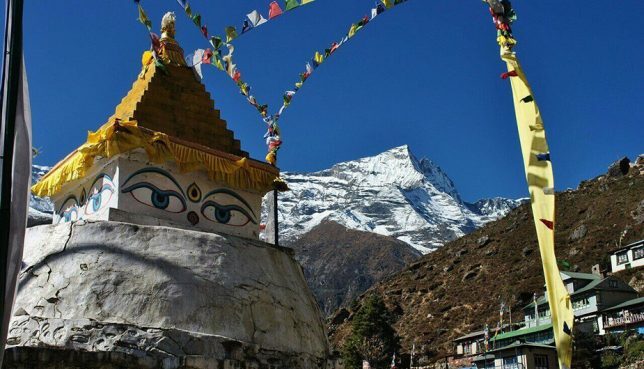 And since May is the last month of this glorious month of Nepali spring, you wouldn’t want to miss out on so many by not visiting the Everest region in the month of May. Your fellow travelers who will be there in plenty will also enhance your trekking experience in May. Why do you go trekking? To get immersed in the beauty of landscape I suppose. There is nothing quite like it. And this is exactly what you get in the month of May in the Everest Base Camp trek. Since summer does not really start in the month of May and neither does the monsoon, the probability that your views will get affected are practically non-existent. You might say, “Why should I care about vegetation?”. 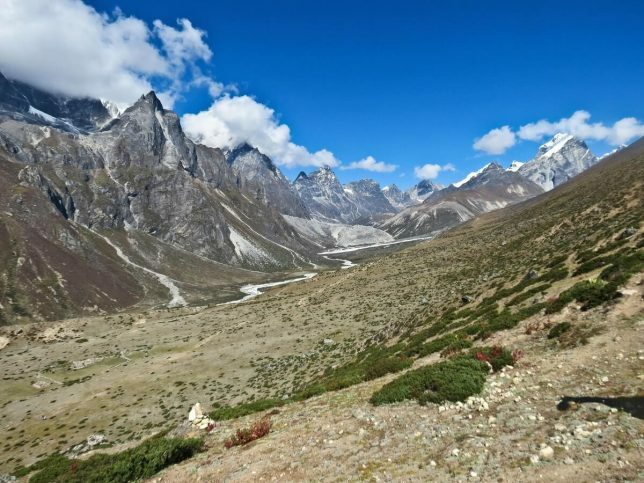 But since you will be in the Sagarmatha region, which has Sagarmatha National Park, you should not miss out on this wonderful national park that harbors many plant and animal species. Forests cover the national park, especially in the lowermost parts. Forests of pine, juniper along with the national flower of Nepal, Rhododendron are found in plenty. A nature lover like you are not supposed to miss it. This is one of the things about travel that is underestimated. And many travelers don’t try to learn culture by intermingling with people of the places that they travel to. You shouldn’t make this mistake. In the month of May, you will find many devotees filling the Tengboche Monastery to practice their faith. The culture in the Everest region is influenced by the Sherpas and Tibetan Buddhism. You will also find people in plenty in other places of the Everest region. So make the most of the opportunity to study people of this place along with the natural beauty in the month of May. 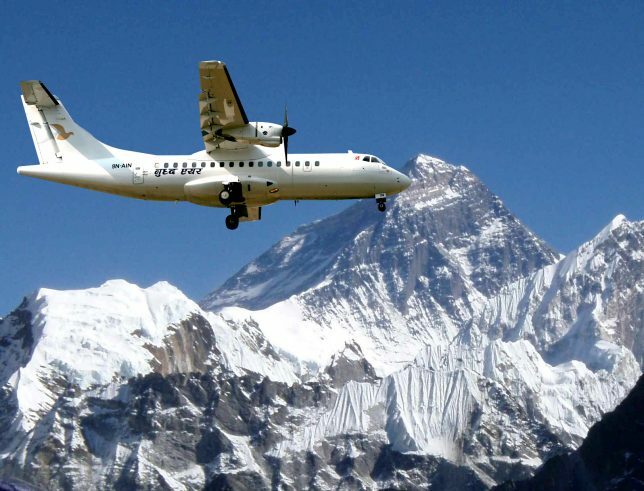 The other thing that you can be assured of while trekking to the Everest region in the month of May is that your flights will be splendid. Along the way to Lukla, you will see the HImalayas in all its beauty. The view that you get in case you want to try the helicopter rides from Namche Bazaar, to the Base Camp or Kala Pathar will not disappoint you either. So whether you are planning to go to trekking, for a helicopter tour or Heli tour, you shouldn’t worry. 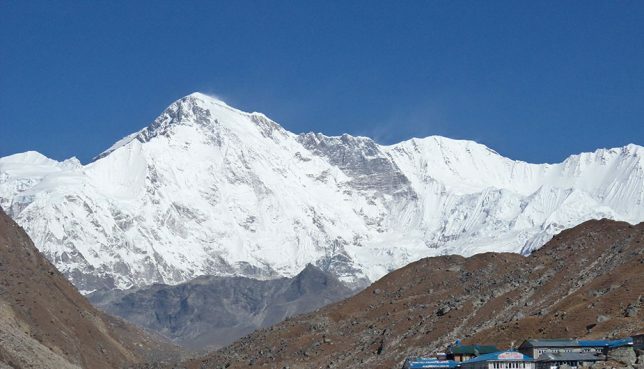 If you plan to trek to Everest, you can push yourself and see the various mountain passes that you will get to experience in the Everest region. The mountain passes are not too high and in terms of altitude, their heights are comparable to that of the Base Camp. In May, the Cho La Pass, which is 5300 meters in altitude and Kongma La Pass which is 5535 meters can be easily scaled too. The temperature during daytime in the month of May is fairly warm. It is about 20 degrees. Isn’t that really sweet? The 20 degrees temperature in the month of May in the mountain doesn’t make your body too warm or sweaty to make your trek too uncomfortable. In fact, the wind that blows in the Everest region has an average speed of 10 miles per hour, is perfectly balanced out by the Sun. And here’s the coolest part. The nighttime temperatures never go below the freezing point. Well, I can’t say never because you never know the mountains, but you can be reasonably sure that in normal conditions the average nighttime temperature is around 5 degrees. The chances of rain is also low in May. It might rain in the latter ends of the month, which is the time when the monsoon season starts. So, if you catch this trek fairly early, your party in the mountains will not be ruined. 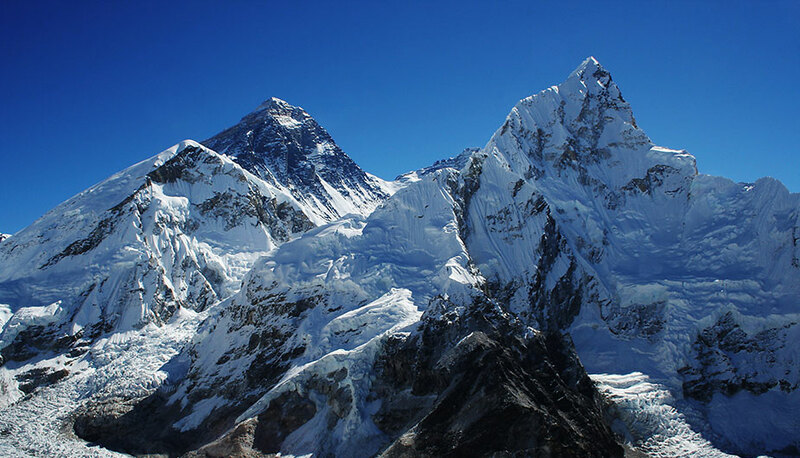 Since May is such a pleasant month, it brings about various ways you can go to the Everest Base Camp. 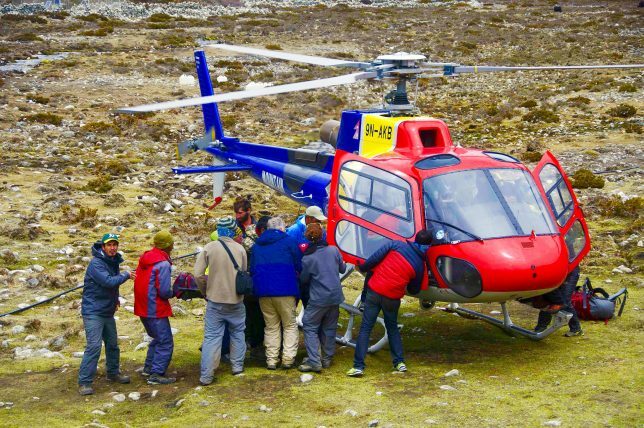 In case you are looking for a fun way of getting to the Everest Base Camp and the views of the Everest without breaking your sweat, a Helicopter tour will be perfect for you. You don’t have to trek at all and still feel Everest. A helicopter will take you to the Everest region. You’ll get to the Base Camp as well as Kala Pathar. And all of that in one day. You’ll also return the very day. Well, isn’t that one super efficient way to get to the Everest region? This is a trip that gives you a chance to fly and a chance to trek. A chance to trek because once you get to Lukla, you will trek to Namche Bazaar and adjust your body to the climate of the region. You can see the various things that this wonderful city has to offer you. From Namche, you will trek all the way to Everest Base Camp. As you descend down, you will get to Gorak Shep / Pheriche. From there, you will come to Kathmandu in a helicopter. Gokyo is another place which you are not supposed to miss because of its awesome features. The water resources, as well as the richness of landscapes, makes this one of the most admired valleys of Nepal. This trek will last two weeks long. You will go to Gokyo Ri, a wonderful peak in this region. You’ll also witness the great lake known as Dudh Pokhari and the famous Ngozumpa glacier. Their sights will leave you wondering in amazement. A backpack that will help you store all your belongings such as electronic gadgets and all the proper clothing. Compartments will help you store things better. Comfortable boots to do away with any problems related to heels and high pressure on other areas. Since there will be a lot of people and solar chargers at the accommodation places will be unavailable. So carry backpack chargers. In your priority list, down jackets, trousers, sunglasses, sunscreen, winter gloves and hats, multi-layer clothing, toiletries, water bottle and basic first aid should come first. There are various alternatives that are available to you for trekking in the month of May. And if you are not up for trekking, you can try flying as well. What a treat!! This is what makes trekking in the Everest Base Camp in May such a joyous trek. The fact that you will be able to experience so much of the place, so much of the people and their culture, and get lost in this season means that if you have not thought of EBC trek in the month of May, you should certainly start.